Each week, the Bible Lesson from the Christian Science Quarterly offers fresh inspiration and healing solutions for life’s many challenges. Using eBibleLesson Express, you can study the lesson virtually anywhere, anytime, and anyplace you like. eBibleLesson Express is a sidebar “widget” that is found on nearly every page on JSH-Online, providing immediate online access to the current week’s Bible Lesson. eBibleLesson Express features the ability to reference the full text online and listen online to a continuous audio loop of the current Bible Lesson. eBibleLesson Express provides some basic functionality, but not all of the functionality of an eBibleLesson subscription. 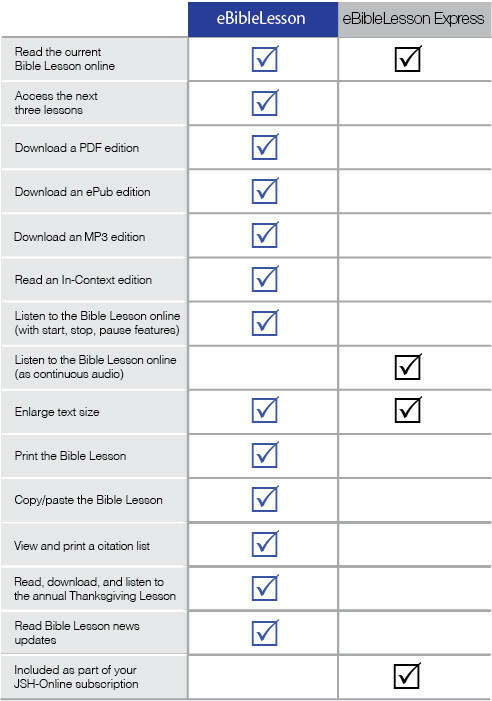 The eBibleLesson Express widget does not allow users to download, print, or copy/paste the Bible Lesson. It also does not provide access to different eBook and audio formats, or make future or past lessons available. To access the full functionality and freedom of downloading, listening, printing, and copying/pasting the lesson in different formats, please subscribe to eBibleLesson.